Illicit trade costs billions of dollars in tax revenues, diminishing legitimate business revenues, distorting economies, eroding social fabric and fueling organized crime. In order to lower the incidence of such illegal trading activities, we need a coordinated response from all the stakeholders, bridge the enforcement gaps which can be exploited by criminal networks, reassess capacities to counter illicit trade, and identify areas which yield greatest public benefit and awareness. Illicit trade is a major concern worldwide. 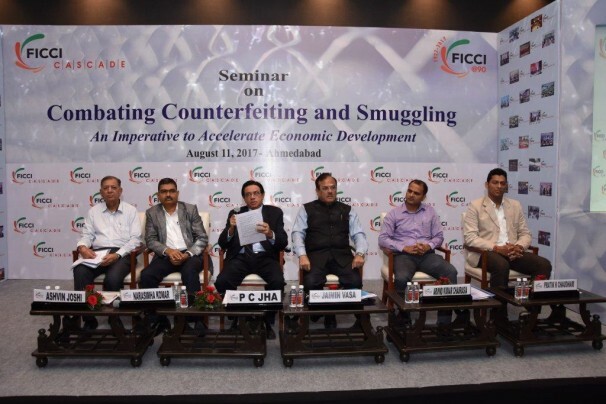 To address this issue, FICCI CASCADE (Committee Against Smuggling and Counterfeiting Activities Destroying the Economy) organized a seminar on ‘Combating Counterfeiting and Smuggling – An Imperative to Accelerate Economic Development’ on 12 June 2018, in Hyderabad. The seminar was organized to provide stakeholders with the tools, information and capacity needed to tackle illicit trade. 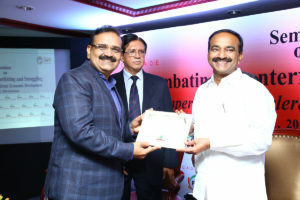 Mr. Etela Rajender, Minster for Finance & Planning, Small Savings, State Lotteries, Consumer Affairs, Legal Metrology, Civil Supplies, Government of Telangana, the Chief Guest on the occasion, stated that counterfeiting and smuggling were a huge area of concern as it acutely impacted the health and safety of the common people, along with massive revenue and tax losses to industry and the governments, respectively. Such is the enormity of the issue that it requires stern deterrence and joint action between all stakeholders. He emphasized on the need for all enforcement mechanisms to come together to combat this menace. The Minister also stated that their government was very proactive in taking actions against the perpetrators. 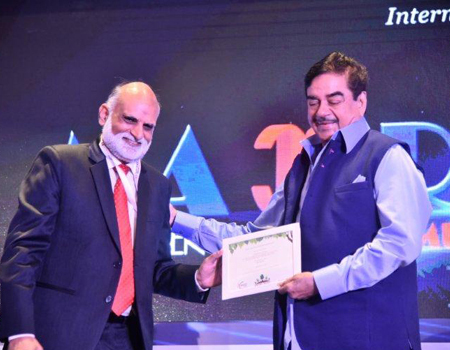 He extended the support of his government to FICCI in carrying forward the initiative against illicit trade, and welcomed the participation of industry and consumers in fighting the growing menace. Mr. Devendra Surana, Chairman, FICCI Hyderabad State Council & Managing Director, Bhagyanagar India Ltd., while welcoming the dignitaries, referred to how counterfeiting and smuggling adversely impacting industries, consumers, government and economies as a whole worldwide. He observed that all stakeholders must understand the need for safeguarding the rights of legitimate industry and work towards developing competitiveness in various sectors of the economy. 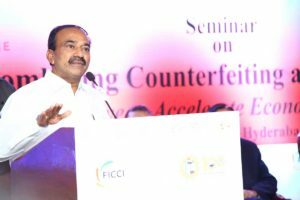 Mr. Gowra Srinivas, President, Federation of Telangana and Andhra Pradesh Chambers of Commerce and Industry (FTAPCCI), in his address, pointed out that counterfeit products were available across all industries. Even in the case of a critical item like intravenous fluids (saline water), more than 5% of the total world trade is estimated to be counterfeited. Rapid technology developments and low barriers to market entry are the main reasons for the increase in such activities. A vigorous implementation of laws was the need of the hour, he emphasized. Mr. Anil Kumar Jain, Principal Commissioner, Customs, in his Special Address, stressed on the need to have a multi-disciplinary approach to encounter this challenge. Society at large, and trade and industry needs to come together to fight this major issue. He said that the problem was two-fold: counterfeiting and smuggling, and needed to be dealt with through collaborative, effective and stern actions. He also highlighted a recent case of illicit cigarette transactions at ICD, Hyderabad. The seminar also held a panel discussion on ‘Countering Counterfeiting and Smuggling: Resolutions and Solutions’, where experts from various fields deliberated on the issue at hand. Mr. 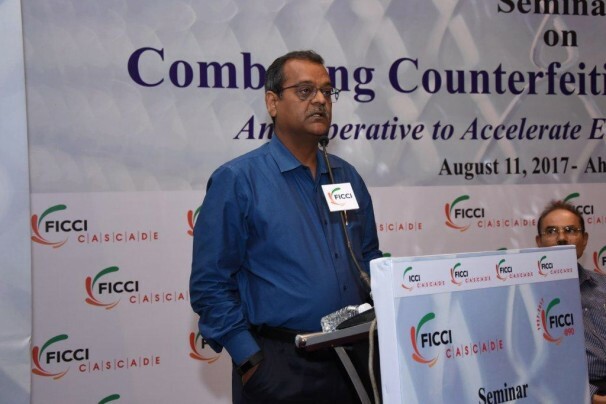 Deep Chand, Advisor, FICCI CASCADE and Former Special Commissioner of Police, New Delhi, who moderated the panel discussion, emphasized on the need for consumers being continuously made aware of the detrimental impact of illicit products. Awareness campaigns that explain to consumers how to differentiate a spurious product from a genuine one, to demanding a copy of the bill from the seller for every purchase, along with the harmful consequences of buying illegal products vis a vis a genuine one, were some of the key points that need to be explicitly conveyed in these initiatives. 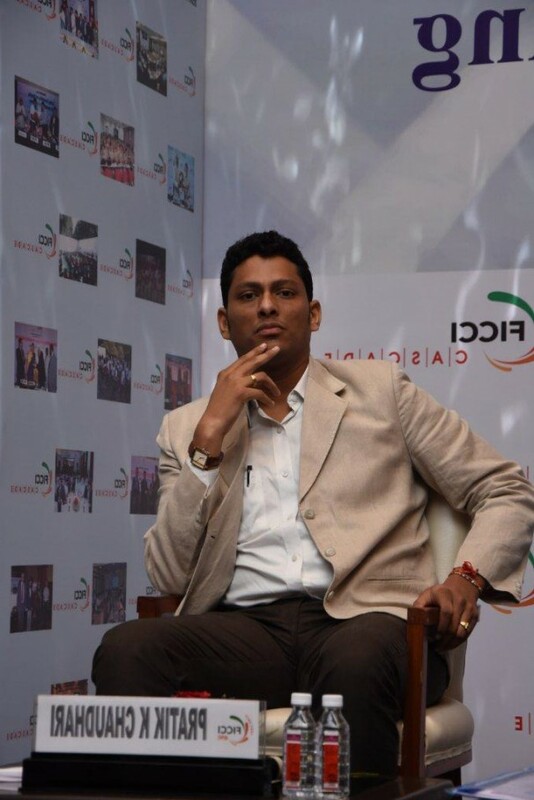 “Counterfeited mobile phones are easily available in India. We track each and every phone by matching IMEI and other features and identify whether it is genuine or not, and only then we allow for their imports”, said Mr. K Surender Paul, Deputy Commissioner, Customs. He also underlined the fact that disparity in taxes and prices of a commodity was another reason for increase in smuggling. Mr. J L N Murthy, Advocate, Jonnalagadda LLP, appreciated Telangana Government’s initiatives to curb illicit trade. 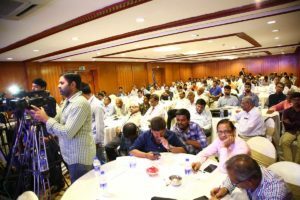 He lauded the consumer awareness program of Delhi Government which was using different medium of communication, and proposed that the Telangana government could also launch a similar drive. Mr. Gouri Sankara Rao, Chairman, Confederation of All Telangana Consumer Organizations (CATCO), underlined the need for Food Safety Officers for every 1 lakh people in India. He affirmed CATCO’s support to FICCI CASCADE in its nationwide awareness campaign to protect consumers rights in terms of health and safety, and proposed extending this drive to the remotest areas in the state”. The panelists were in agreement that an effective deterrent in the form of strong laws was needed to be put in place to successfully curb the illicit trade menace. 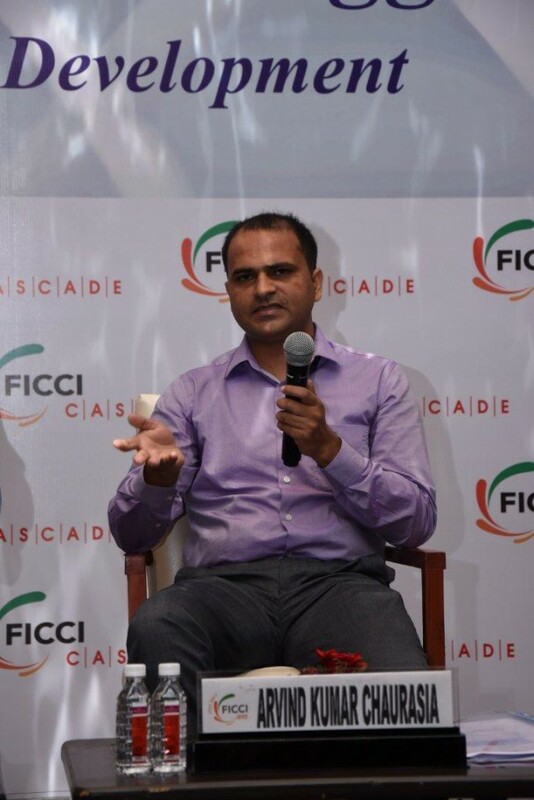 Mr. Akhilesh Mahurkar, Head, FICCI Telangana and Andhra Pradesh State Council, proposing the Vote of Thanks, said that FICCI CASCADE will continue its campaign against illicit trade taking along all stakeholders in this activity, and thanked Minister Etela Rajender for his continuous support to FICCI’s initiatives. 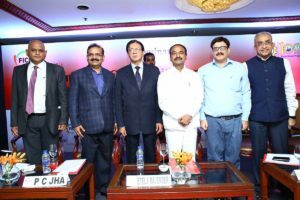 The event witnessed enthusiastic participation of all the stakeholders present in the seminar, including representatives the government and enforcement agencies, consumer activists, the media personnel, and the industry and legal experts. Over 190 people attended the seminar that saw intense interaction with delegates demonstrating an active interest in the issue. The program concluded with a consensus that to mitigate this global risk, both the public and private sector decision makers needed a firmer understanding of the problem, the nature of its impact on the country’s economy, and a clearer understanding of the conditions that enabled it.